Parasites come in many sizes, shapes, and levels of "severity" for our pets. 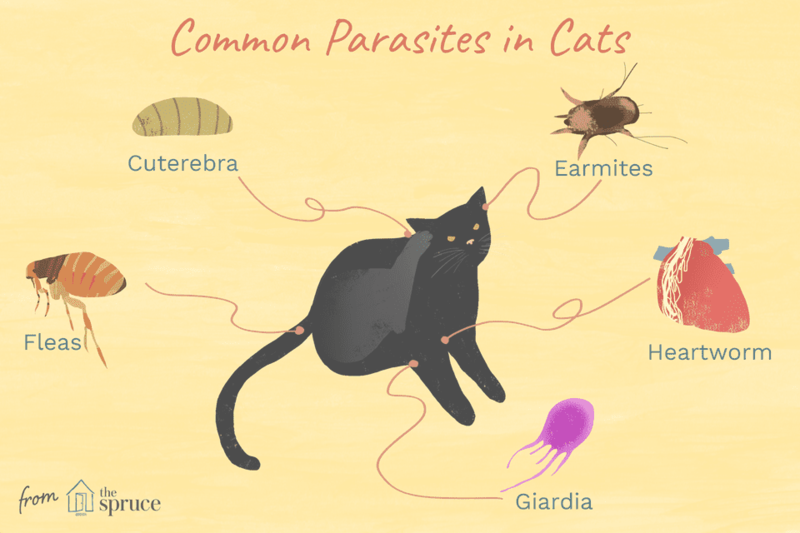 This collection of parasites are those commonly found in cat and other species, sometimes affecting humans (called a zoonotic disease). 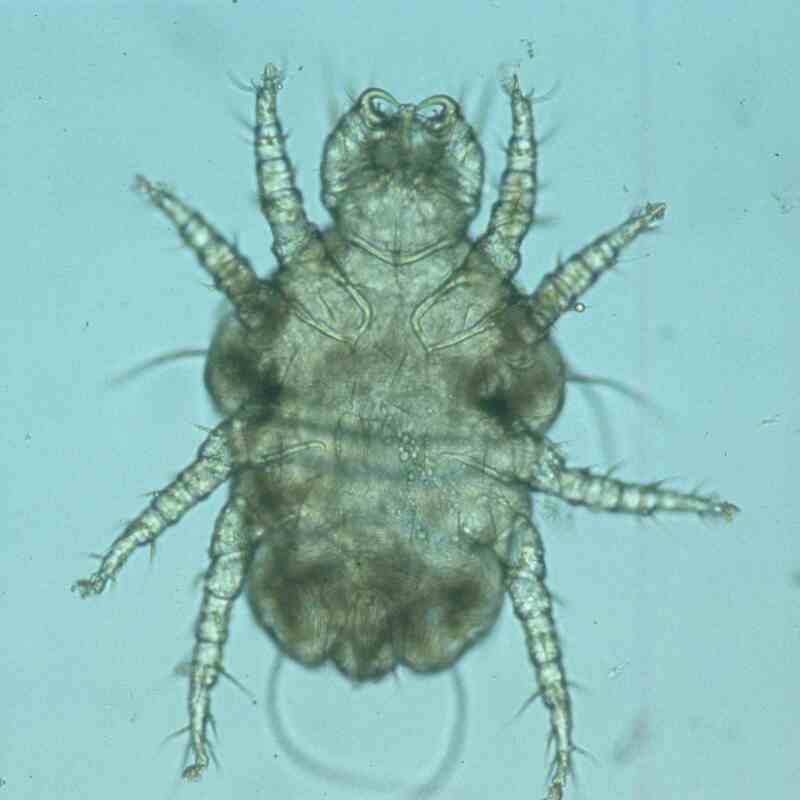 Cheyletiella mites live on the skin, causing irritation, dandruff, and itchiness. A distinguishing feature of this mite species are the large, claw-like mouthparts. These mites can be found quite commonly in cats, dogs and rabbits, and other species. Though humans are not a natural host for this parasite, Cheyletiella mites can happily live on humans for a while, causing an itchy rash. A Cuterebra parasite is an opportunistic parasite found under the skin of small mammals. This parasite is the larval stage of the Cuterebra fly, who uses animal hosts to complete its life-cycle. Learn more about this parasite, most commonly seen in summer and fall. Ear mites are tiny parasites that live out their life cycle mostly inside the ear canal. They are quite common and can cause severe irritation and itchiness of the ears. The most common ear mite of cats and dogs is ​Otodectes cynotis, and therefore an infestation with ear mites is sometimes called "otodectic mange." Fleas make pets' lives miserable, and humans begin to itch just at the thought of them. Vets are often asked what pill, drop, dip, collar, or shampoo works the best to get rid of these pesky parasites. The answer is that there is no single method or insecticide that will completely eradicate (or at least control) a flea problem. The flea life cycle is fairly complex, and understanding the various stages will make it easier to get rid of them. Giardia is a one-celled protozoan parasite that lives in the intestinal tract of many animals. When this parasite produces a diarrheal disease in animals (including humans), it is called Giardiasis. Learn about this parasite, how it is transmitted, signs of disease, and how it is diagnosed and treated. Heartworm disease is caused by a parasite that lives mainly in the blood vessels of the lung and in the heart, transmitted by mosquitoes. Heartworm disease has been seen in several species, but dogs are very susceptible. It can be fatal and is difficult to treat, but fortunately, heartworm disease is easy to prevent. Hookworms are intestinal parasites that are relatively common in cats. There are a few species of hookworms that affect cats, and some can also affect humans by migrating within the skin. Whipworms are intestinal parasites that are relatively common in dogs ​but only occasionally seen in cats. Whipworms are small worms, reaching a maximum size of 2-3 inches. They have a thin, whip-like front end and a thicker back end. They attach themselves to the walls of the large intestine, feeding on blood. There are many ideas about the best way to remove a tick; one of the most common tricks being to put a lit match on the tick to make the tick "angry" enough to back out on its own. The truth is, this can actually make things worse for you and the tick by injecting more foreign material into you (or your pet) from the tick. Early removal of the tick is very important. Find out how to check for and remove ticks safely in this handy how-to. Technically not a parasite, Ringworm derives its name from the classic red, round "worm-like" lesion seen on human skin that is infected. Ringworm is a fungus that may or may not create clinical signs in animals, but may spread from animals to humans, creating the classic lesion.